$35,000 Model 3 sedan, but there are plenty of obstacles on the road to mass adoption. One of the biggest hurdles is infrastructure. In a nation where there is a gas station on every corner, finding a car charger that works and is open for use can be a scavenger hunt. A public network of chargers is evolving, but it’s tough to catch up to gasoline, which can be purchased at 168,000 filling stations nationwide. 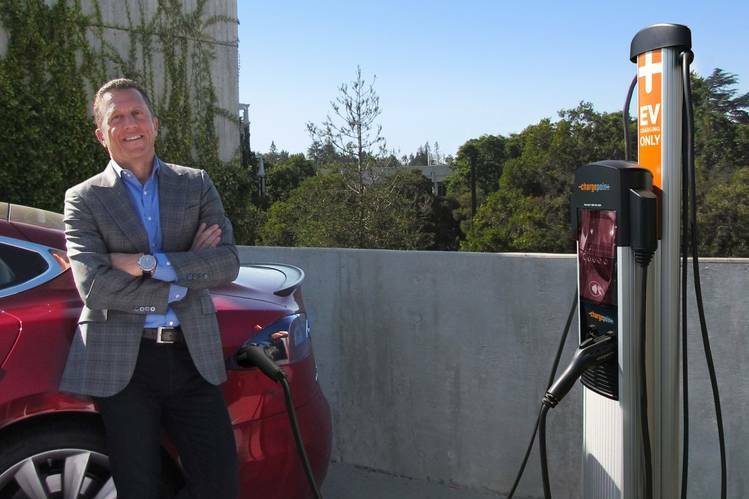 chief executive of ChargePoint Inc., is working to change views on what the charging network of the future will look like. The Campbell, Calif., company has 39,000 charging spots set up in garages, parking lots, apartments and other locations, with several hundred of them capable of so-called DC express charging, which can provide 200 miles of charge in an hour for cars currently on the road and promises much faster fill-ups as car batteries become more advanced. The 51-year-old Mr. Romano says copying the gas-station model is a mistake. “That’s just an artifact of the fuel choice that we’ve used for the last 100 years,” he says. As electric vehicles become capable of going further on a single charge, drivers increasingly will be able to simply plug in at home or work, minimizing the need for roadside depots that sell everything from lottery tickets to diesel. , which is making a $2 billion charging-network investment as part of an emissions-cheating settlement with U.S. regulators. Auto suppliers also are developing charging technology, and some gasoline stations may add chargers, too. WSJ: Why can’t we meet the nation’s charging needs by simply re-creating the gasoline-station network for chargers? MR. ROMANO: The infrastructure won’t match because that isn’t how you’re going to fuel an electric vehicle. Imagine a world in which your car charges when it is parked. You won’t have to go someplace to charge your car. That means the gas station where you buy your lottery tickets or coffee or whatever—most of them are gone under this model. The only ones that will be needed will be those along highways. 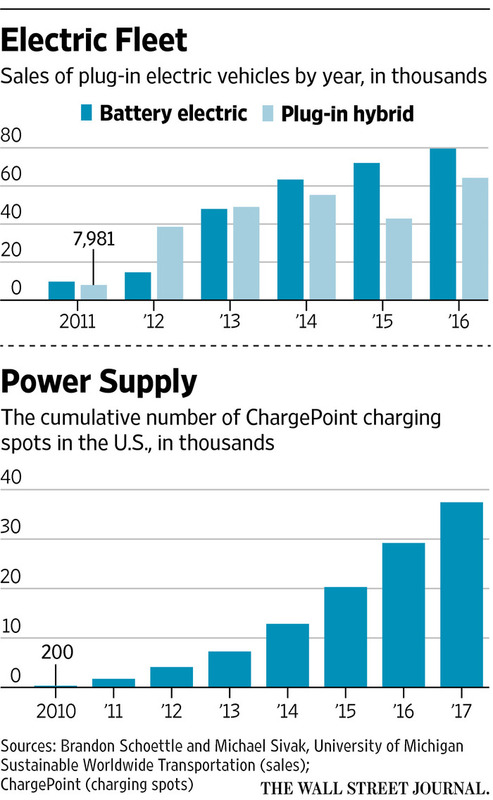 WSJ: A lot of people complain that chargers are hard to find. MR. ROMANO: Go to the app store, download our mobile app—it’s free—and type in some random addresses in the address field. Zoom the map in and you’ll see what chargers are already there. You’ve probably driven by them and never seen them. There’s no advertising, there’s no canopy, because it isn’t a destination. It happens to be where you’re parking. If you want to actively seek them out, you use modern-day technology like a mobile app, not your eyeballs and a sign. WSJ: So this is less about finding the gas-station equivalent of a charging station and more about figuring out how chargers can conveniently be integrated into people’s typical tasks during the day? WSJ: Do electric-car sales need to increase in order for more infrastructure investments to be made? MR. ROMANO: If businesses all over the country put in chargers for their customers or their employees, more cars would show up. And if they put in even more ports, then even more cars would show up. And [it would keep going that way] until we replaced the entire fleet with electric vehicles. WSJ: What about wait times for charging? Is that an insurmountable problem? MR. ROMANO: If I can put 250 miles of charge in my car in 10 minutes—which the chargers we have now could handle without tearing out any infrastructure—the wait time is no big deal. After a couple hundred miles of driving, I’m probably ready to stop to walk the dog or get a coffee or use the restroom anyway. I do long trips five or six times a year so I don’t care [about wait times]. I’ll stop and have a coffee, have some lunch, or do whatever. Most of the time when I stop with my Tesla Model S, I haven’t even finished my Starbucks coffee before I’ve got enough charge to get to my destination. WSJ: How do you view Volkswagen’s Electrify America charging project, in which the German auto giant agreed to build an extensive network of charging stations in the U.S. as part of a settlement? MR. ROMANO: It’s best to have a set of infrastructure that isn’t driven by a single car company to keep the industry as fair and balanced as possible. And you’re going to see not just Volkswagen but lots of companies pursuing projects in the U.S. that look like gas stations but are dedicated to charging vehicles. Some highway gasoline stations might start to serve the electric vehicle, as well. WSJ: But your view is that we don’t need a lot of long-haul fast-charging stations, right? MR. ROMANO: We only need a fraction compared with what we have for gas stations because you’re going to be acquiring most of your fuel at home or work. There isn’t a lot of debate about that. We are going to need a few thousand, not 150,000. WSJ: There is a lot of talk about wireless charging pads instead of plugs. Is that the future? MR. ROMANO: At-home wireless charging may have a place, but plugging in a car is about as hard as plugging in a consumer device, most of which don’t use wireless charging. There are, however, a couple of cool applications for wireless charging. Say you have an old house and your garage [is so small or configured in a way that makes it inconvenient or impossible to park an EV and plug it in]. Autonomous parking [where the car folds the mirrors in and parks itself], along with wireless charging, could make a lot of difference in those applications. The problem with wireless charging in public places is the construction, plus the fact that you still need to have cables with you because not everyone is going to have it. And in inclement-weather areas, the ground [where the charging pads are stationed] could get pretty torn up in the winter with plows and things like that. Mr. Stoll is a bureau chief for The Wall Street Journal in Detroit. Email him at john.stoll@wsj.com.